The future of bird conservation depends on people caring about birds and the natural world. With each passing day, advancements in technology in our ever-changing world are pulling kids further and further from time outdoors. Devote a few minutes to take your kids out for a walk. 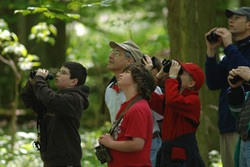 Volunteer to lead nature hikes for kids at a nature center, for your local Audubon Chapter, for your family and friends. You don't have to be an expert to take people on a bird walk. All you have to have is enthusiasm; the birds will do the rest! If you're interested but still uncertain abut the best way to go about it, here are some great tips on How to take someone on their first bird walk. Since the 1930s, the Federal Duck Stamps have contributed over $850 million and have helped to protect 5.5 million acres of habitat for wildlife and future generations. Buying the stamp is perhaps the single simplest thing individuals can do to support a legacy of wetland and grassland conservation for birds. Virtually all the stamp proceeds ($.98 of every $1) go to help secure valuable Refuge System habitats. 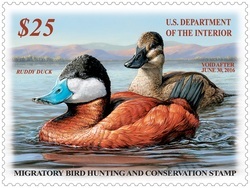 2) provide proof that birders will voluntarily purchase this stamp in order to support the resource. You can purchase your NEW Duck Stamp HERE via PayPal, by calling the BSBO office at 419 898-4070 to order over the phone. 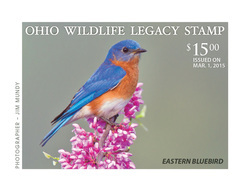 The Ohio Wildlife Legacy Stamp is available for purchase in the Black Swamp Bird Observatory Gift Shop. Or, you may purchase your stamp today using PayPal HERE by calling the BSBO office at 419 898-4070 to order over the phone. Domestic cats (Felis catus) can provide excellent companionship and make wonderful pets. But when allowed to roam outdoors, this non-native, invasive species threatens the welfare of birds and other wildlife and endangers the integrity of the ecosystems into which domestic cats are introduced. Domestic cats are recognized as a threat to global biodiversity. Cats have contributed to the extinction of 33 species across the world and continue to adversely impact a wide variety of species, including those that are threatened or endangered. 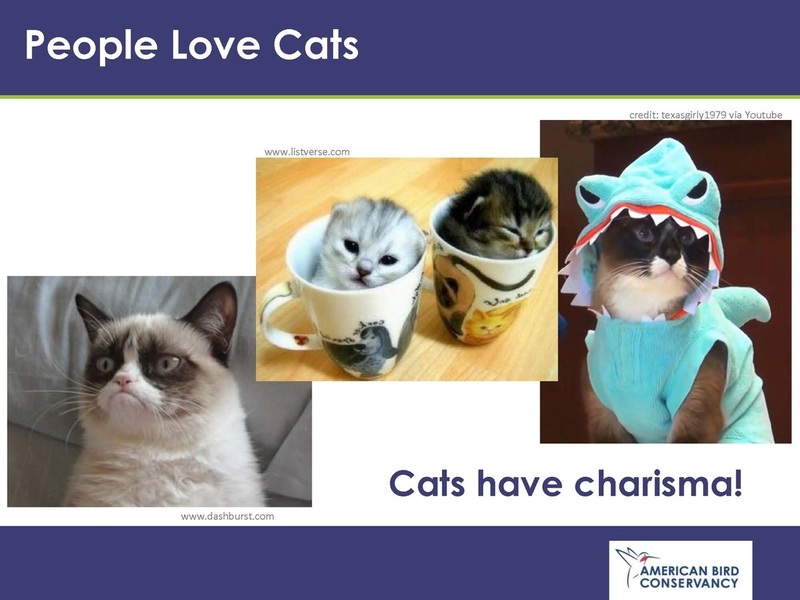 The ecological dangers are so critical that the International Union for the Conservation of Nature (IUCN) now lists domestic cats as one of the world’s worst non-native invasive species. In the U.S., free-roaming domestic cats kill an estimated 1.4-3.7 billion birds and 6.9-20.7 billion mammals. The sheer quantity of cat-caused mortality is staggering. For perspective, consider that 1.4 billion is equivalent to the entire human population of China, the most populous country in the world. As the number of cats continues to grow and owners continue to allow their pets to roam, harmful impacts will surely increase. Every year, thousands of birds become entangled in abandoned fishing line and die from drowning, starvation, dehydration or strangulation; sometimes these animals struggle for days before they die. How You Can HelpBecause fishing line is such a potent hazard to birds, it is imperative that it be properly cleaned up and safely disposed of. Whether or not you fish, you can always help. Here's a wonderful short clip featuring this issue from our friends at Cleveland's WKYC Channel 3. Remove any discarded line you come across, or any line that breaks when you are fishing. Look for tangles whenever you are birding in a riparian area that is open to fishing. Organize a fishing line collection from your local birding club, school group or service group. Carry small scissors at all times in order to cut line free if you do find it. Contact bird rescue organizations if you find a tangled bird so it can get help quickly. Only fish in authorized areas where the risk of line tangling in trees or brush is minimal. Use the proper fishing line weight and tackle when fishing to minimize the risk of breakage. Share information about how fishing line hurts birds with other fishers so they can take appropriate steps to safeguard wildlife. Fishing line may itself be lightweight, but it is a heavy risk to many types of birds. Understanding those risks is the first step in being able to help keep birds and other wildlife safe in fishing areas. Drinking certified bird-friendly coffee is an easy (and tasty!) way to support bird habitat conservation. To read more about how drinking shade-grown coffee helps migratory birds, please click HERE. BSBO is happy to recommend BIRDS & BEANS for your certified bird-friendly coffee choice. We want to make sure that people who enjoy coffee and care about conservation can get great coffee that they know is good for bird conservation, family farmers and the environment. Our commitment to quality and service ensures that fresh roasted, great tasting ‘Birds & Beans the good coffee’™ fly’s straight to your door and into your cup. For more information or to order, click here. In the spring of 2005 Kenn Kaufman’s Field Guide to Birds of North America became the first field guide to the birds of the U.S. and Canada to ever to be published in the Spanish language. The vision for a Spanish language bird guide was to help to recruit scores of new birders from among the more than 28 million Americans who speak Spanish at home. In today’s world, our natural resources are facing countless threats. Kenn’s idea is that the more people we can awaken to the beauty and importance of our natural world, the more support we win for conservation. Black Swamp Bird Observatory believes in Kenn’s vision, so we put together the DONATE THE GUIA program to help get this book into the hands of people who can really use it. We’re working with many partners, including Sonoran Joint Venture, Connecting Cultures (A program of Environment for the Americas), and The Biggest Week In American Birding, to help us distribute copies of the Guia to people across the southwestern US and northern Mexico. These books will be used as valuable tools for bird guide training workshops. Handing out these little calling cards is a highly-effective way to let business owners know that birds mean business. And when we help business owners understand that being proper stewards of the habitat that brings the birds is what brings the birders and the business, we can then engage them in our conservation efforts. Click HERE to download a PDF of printable cards. All released balloons, including those falsely marketed as “biodegradable latex”, return to Earth as ugly litter. They kill countless animals & cause dangerous power outages. Balloons are also a waste of Helium, a finite resource. Balloons can travel thousands of miles & pollute the most remote & pristine places. 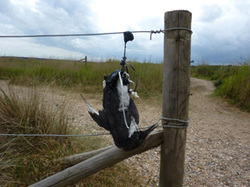 A simple search on the internet reveals a startling number of graphic photos (like the one of the Guillemot (pictured to the left) hanging from the fence after becoming entangled in balloons and strings). Volunteering is a great way to support conservation - and learn more about birds and the environment, too. At BSBO, volunteers play a pivotal role in every aspect of our mission. If you're in our area, we'd love to have you join our team. If you're from further afield, look for a bird observatory, nature center, or other conservation organization to contribute your time to. You CAN make difference! Learn more about volunteering for BSBO, HERE! FOR 101 WAYS TO HELP BIRDS, WE HIGHLY RECOMMEND THIS WONDERFUL BOOK BY LAURA ERICKSON!